Chebanse (population 1,148) is located off of Interstate Highway 57 approximately 9 miles south of Kankakee. Chebanse straddles the Iroquois / Kankakee County line. The town was founded in 1854. 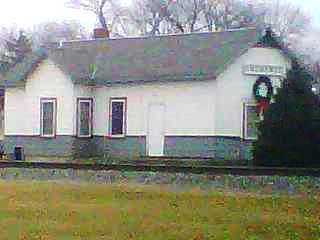 The Illinois Central Gulf Railroad runs through the center of town. Read more about Chebanse at the following web address: http://www.chebanse.net/GreenIllinois.html . The school system in Chebanse was probably established in the late 1800s. Chebanse townspeople supported their own school district, including a high school, for many years. It was in the late 1940s that consolidation talks began between the towns of Chebanse, Clifton, and Ashkum. This consolidation became effective after the 1949-50 school year with the creation of the Clifton Central School District. 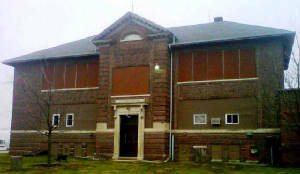 The high school was located in Clifton. Chebanse landed a grade school for the Central School District for grades PK - 4. The original Chebanse High School building is pictured above. For years it was used as a community center by the residents of Chebanse. However the building, though secured from the outside, is falling into a state of disrepair on the inside. It is believed the main portion will be razed in the future. Chebanse High School definately offered baseball and besketball. It is thought that track was also offered for the boys. The IHSA (www.ihsa.org) accomplishments of Chebanse High are noted below. There is a real nice account of the Chebanse High School boys basketball team listed on the IHSA web site. The two District Championships won as well as three other good seasons are listed below. 1945-46 14 - 9 (good record) Coach Henry Wulfe, Jr. The Chebanse boys baseball team brought home a District title too. The Class of 1947 and 1948 must have been a talented group as the team of 1946-47 won a DIstrict Championship to go along with the two they won in basketball. The coaches names and team records for the baseball program are not available.